The distinctive conditions on a boat or other vessel make wearing ordinary shoes quite risky. This is why for safety and comfort purposes, you should get yourself a pair of fishing shoes before you head out onto the water. To help with this, We investigated some of the best fishing shoes that you should own. These shoes offer grip on slippery surfaces, are comfortable when worn for long periods of time, and prevent water from getting into your shoes. The Columbia Bahama Vent is a good choice for an angler who wants a functional pair of shoes but isn’t willing to compromise on style. 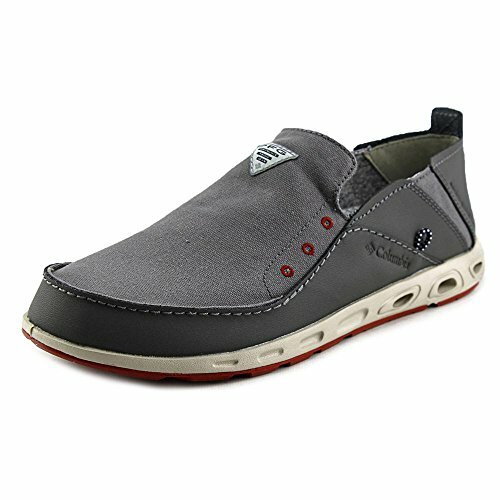 These slip-on shoes have an upper made from a comfortable yet durable combination of leather and canvas. The midsole is made from the patented TechLite system which ensures that the sole of your feet are properly supported. It has been constructed specifically to absorb as much impact as possible. This even distribution of the weight makes the Bahama Vent wearable for hours on end, even if most of your time is spent standing. The shoe contains plenty of air ports in the midsole. This serves two functions – one, it improves air flow in and out of the shoe. It also helps to quickly drain any water that flows into your shoe. 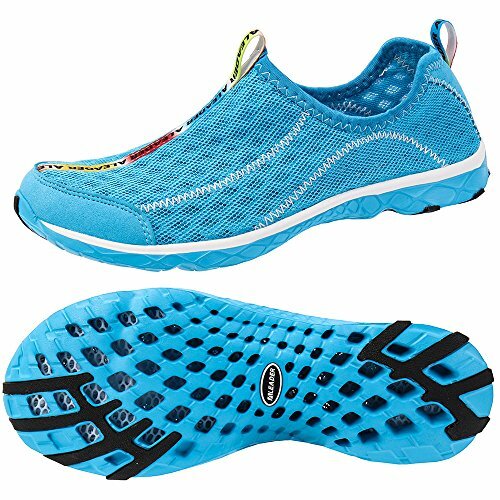 The other notable feature on the shoe is the Omni-GRIP, yet another trademarked design. This is a high traction sole complete with razor siping. This ensures that the shoe will be able to grip even the wettest and slipperiest of surfaces. The Bahama Vent is available in a variety of designs but only comes in men’s sizes. Despite bearing the title ‘mesh’, these Aleader fishing shoes are made from a more hi-tech version. These shoes are constructed from hydrophobic mesh which goes a long way in repelling most of the water. The water that does get in is quickly moved out of the shoe with the help of the FluidFlow technology. The water moves from the upper sole to the holes present in the outsole. The mesh also has the advantage of being quite breathable. Not only does this improve airflow, it helps the material to dry that much faster. The Aleader shoes perform well even in several inches of water. This is due to the lateral contrast stitching support system. This locks the position of the foot inside of the shoe, allowing you a comfortable fit, even as you are wading through water. Of course, one of the most important parts are traction and the Aleader shoes have tackled this with an excellent grip on the sole. To add to the traction, there are rubber pods placed on high wear areas of the shoes. This improves the grip that the shoes have on wet surfaces. These shoes are available in both men’s and women’s sizes. Perhaps the most outstanding feature of the Olukai Nohea Moku is the comfort and the support that it affords. The interior of the shoe has been designed to cradle your foot perfectly, which provides arch support while maintaining the stability of your heels. The footbed is made from dual density polyurethane which makes the shoe incredibly lightweight. It also allows for an ideal environment inside the shoe as it is excellent at regulating temperature and encouraging air flow. Underneath this is a gel insert that provides additional cushioning. Not only can the footbed be removed, it is also washable. All of the materials used for the Nohea Moku are breathable and quick drying. Regardless of the external conditions, your feet will remain cool and dry. The shoes also contain medial water drainage ports to ensure that all of the water is flushed out of the shoe the moment it gets wet. The sole of the shoe is made from non-marking rubber. It contains razor siping so that the shoes will readily grip wet surfaces. The collapsible heel on the shoe makes it simple to put on and take off while the lace-up feature allows you tightly secure the shoe. The Shimano Evair is an excellent option for the angler who wants greater breathability. The upper sole of the shoe is made from molded EVA and has several large holes. This allows for a lot of air flow while still maintaining the support of a shoe. In fact, these shoes are so great at drainage that you can even use them while wading. It is not only the design of the Evair that is exceptional but also the material used. The molded EVA is meant to absorb shock that is typically located at the heel. By doing this, it reduces the amount of stress placed on your feet. It also has an ergonomic arch design to support the arches. This provides you with comfort as well as reduced fatigue after long fishing trips. Since the shoes weigh just 9 ounces, it is almost like wearing flip flops. The inside of the Evair is waterproof and can be removed to be cleaned. The outsole is made from non-marking rubber and has been designed for optimal traction. The Evair has been specifically created to offer optimal comfort on warm days while still providing safety on slippery services. The Under Armour Kilchis shoes have everything that you need for a good fishing shoe. 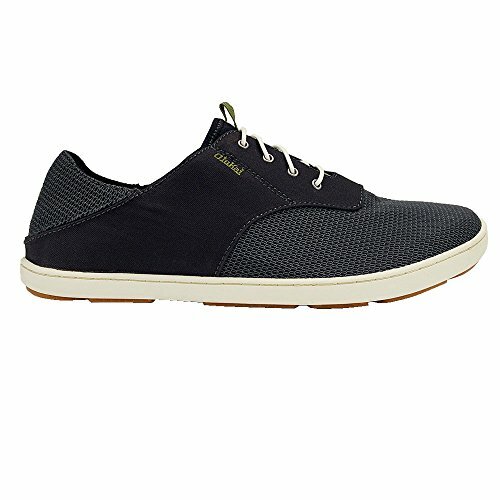 One of the best parts of these shoes is the upper sole which is made from textile. This material is light, breathable, and dries incredibly quickly. The water that does make its way into the shoe is quickly drained through the midsole. The Kilchis are also quite comfortable with a contoured midsole to fit all types of feet and arches. Perhaps the crowning feature on these shoes, however, are the outsole. The trademarked J-Step nonmarking rubber sole has been specifically designed to improve traction when on wet surfaces. The shoe feature laces which allow you to get a better and more supportive fit. The Kilchis are incredibly light and are great for wearing for long periods of time. The upper sole has welded synthetic overlays which help to protect the shoe from abrasions. That being said, this is not a shoe that is can withstand a lot of abuse. This is best suited for remaining on a vessel as it is not suited for more challenging activities. The shoes are available in separate designs and sizes for both men and women. 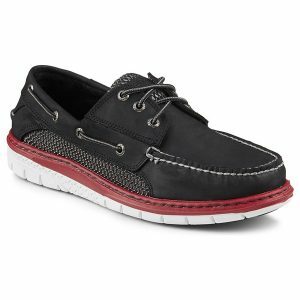 The beauty of the Sperry Top-Sider Billfish shoes is that they look nothing like fishing shoes. You get to maintain a sense of style while still benefiting from its fishing-friendly features. The Billfish is constructed from 100 percent authentic leather. Due to this, these are a pair of shoes that can undergo a lot of scuffing and still remain undamaged. The moccasin stitching around the toe also ensures that the shoe is held together, despite years of exposure to the sun and elements. There are two panels on either side of the shoe that allow the air to circulate and can allow water to drain out as well. The Billfish also offers a lot in the way of comfort with an EVA cushion midsole. The heel cup is also made from EVA and is shock absorbing. The non-marking rubber outsole has the patented Wave-Siping which offers an equal amount of traction for both dry and wet surfaces. One of the most noticeable things about wearing a pair of Billfish is that they are very lightweight. This reduces foot fatigue considerably, even when the shoes are worn for the whole day. 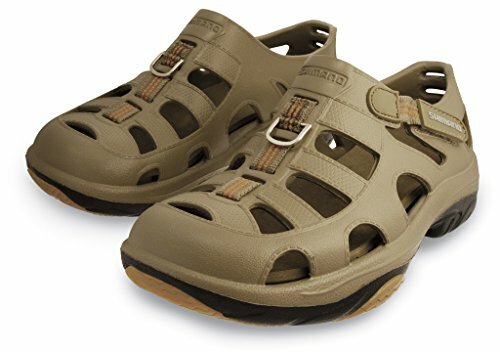 There are certain features that shoes should have in order to provide you with the comfort and support that you require while fishing. When it comes to fishing shoes, it does matter what type of material the shoes are made of. The most common types of material used are mesh, canvas, and on occasion, leather. The material that you decide on should depend on the type of fishing that you do. For instance, leather may seem less than ideal for such conditions but most boating shoes are made from leather that has been treated to withstand water damage. If you are unlikely to encounter too much water or will be fishing off a pier, for instance, you could get away with wearing leather. If it is more likely that you will be submerged in water, perhaps go wading, then mesh is a better option for you. Mesh quickly drains water so that there will be no water logging inside of the shoes. This type of material is quite lightweight and dries fast as well. For conditions that are somewhere in the middle, canvas will suit you well. Canvas shoes, too, have the advantage of drying rather quickly. Unlike mesh, however, they are better equipped to protect you from the sun and other elements. It is quite common to find fishing shoes that are made of more than one material. In this instance, decide on which properties are most important to you and choose the materials that best exhibit them. If you do intend on getting your feet quite wet, you may want to consider what water draining features a pair of shoes have to offer. Now, these tend to differ depending on the brand and the design. The most typical structure, however, is drainage ports or holes. These can be placed either on the upper sole or the midsole and can vary in size. When examining the drainage ports, you should also consider how much protection you want. If you don’t mind your feet being exposed to the sun and wind, then you can opt for ports in the upper sole. Nonetheless, if you want some coverage, then it is best to go with drainage holes in the midsole. These days, most fishing shoes have been designed with other activities in mind. This is why they tend to be a lot more comfortable. When determining comfort, you should focus on the level of cushioning provided inside of the shoe and just how well the interior is contoured to fit your feet. What you will find comfortable will largely depend on your foot. For instance, if you have flat feet, a wider shoe will be more comfortable while higher arches will appreciate arch support. Therefore, you should make a decision according to what is best suited to you. Many fishing shoes also have shock and impact absorption features as well. This is not necessary if you are only going to be fishing. However, if you are planning on walking or running, this can be a useful addition. For fishing alone, the weight of the shoe is quite important. The lighter the shoe, the less tired your feet are likely to get while wearing them. This allows you to wear them for a longer period of time. One of the main reasons for wearing fishing shoes is because of the grip. Regular shoes offer enough traction for dry surfaces. You will need something with better grip because you are likely to encounter slippery surfaces. Each brand of shoe will have their own patented grip so it can be difficult to compare them by sight. If you will be on a boat, it will be helpful to get a non-marking outsole. This will prevent any scuffing on the boat deck. Perhaps one of the most complaints regarding fishing shoes are the sizes. First, there is variation from manufacturer to manufacturer. Also, depending on the design, the shoes can run in different sizes. This means that you can’t always judge the size of the fishing shoe by comparing it with a normal one that you own. Instead, it is better if you take measurements of your foot and to compare it to the ones offered by retailers. This is particularly important when shopping online. Another thing that you should think about is how easy the shoes will be to clean. Since you are fishing, it is quite possible that your shoes may get covered in slime, salt, and perhaps blood. There is nothing you can do about this but you should be able to get it off your shoes with relative ease. These are the most significant features to look when trying to decide on the right fishing shoes for you. Of course, the ones mentioned in this article will serve you well.